going around in my head for the last week. and the blessings of life, family, and friends. I will show forth all thy marvelous works." Christ our God, to Thee we raise this or hymn of grateful praise. Christ our Lord, to Thee we raise this our hymn of grateful praise. so I used what I had and made a pot pie. It was the perfect dish for the cool and cloudy Fall evening. In a large bowl, mix all ingredients except the butter. In a medium bowl stir together flour and salt. gently toss with a fork. Repeat until all the flour mixture is moistened. On a lightly floured surface, use your hands to slightly flatten 1 dough ball. Roll dough from center to edges into a circle. Transfer dough to a deep dish pie plate. Place pot pie filling into the pie plate and dot the mixture with 2 tablespoons of butter. Roll out the second dough ball and place on top of filling. Trim and crimp the edges of the dough. Cover crust edges with tin foil and cook at 375 degrees F for 40 minutes. Remove tin foil and cook for 25 - 35 minutes longer. and gathered some leaves and pinecones for a fun school project. We ended up making a mobile that looks great hanging outside. This is a great project for kids since you can take them on a nice, Fall walk. Have your sweetie write on the wood. Punch a hole through the leaf and tie on some yarn. and use the push-pins to hold the string. Happy Crafting and Memory Making! Well, as of Saturday, Fall has officially arrived! It smells and feels like Autumn and it has me wanting a new Fall wardrobe. So I decided to make some fun skirts that I can wear with tights and cute cardigans. 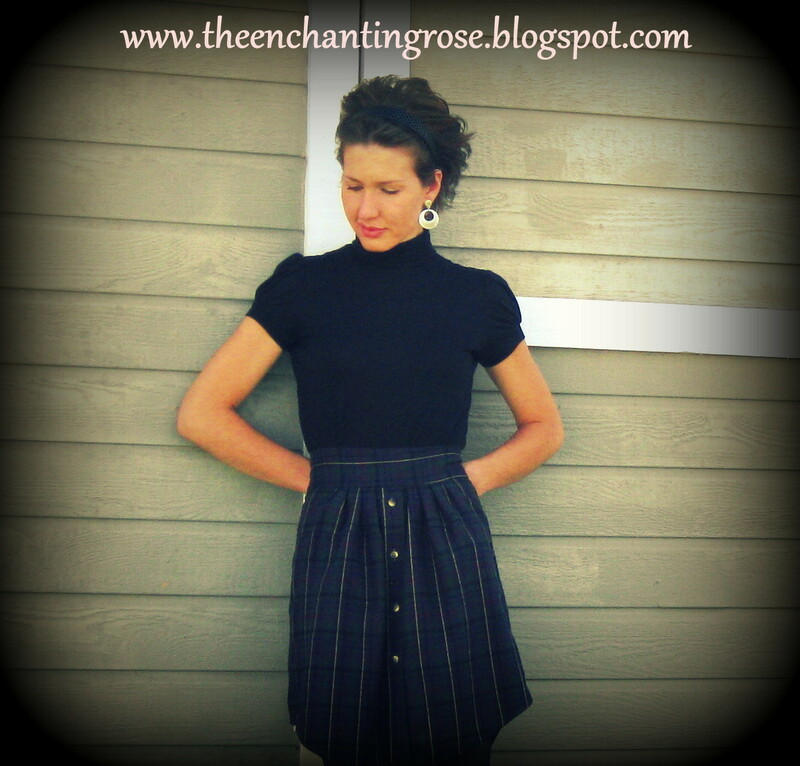 And the best part is you don't have to go to the fabric store to buy fabric to make these skirts. 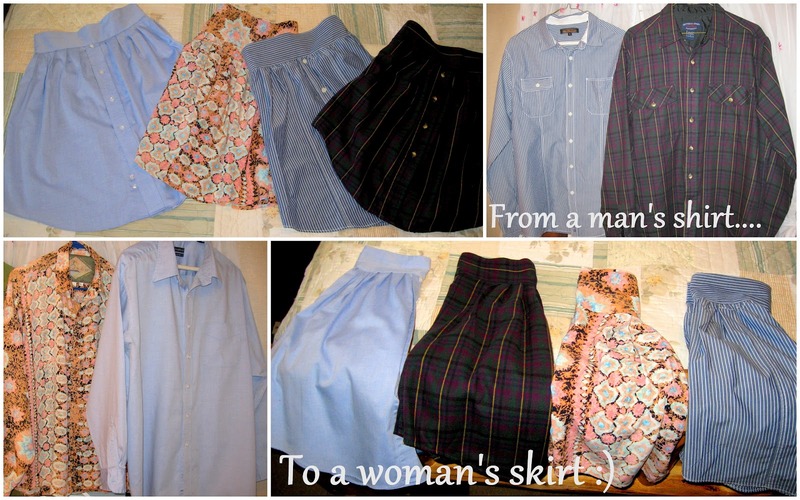 and find a dress shirt to use for this project. Wash and iron your shirt. Lay out your shirt and cut right below the sleeves. Find the middle on the back of the shirt and cut all the way down. Cut out the waistbands on the sleeves. and cut out your waistband from this measurement. and the side waistbands were 7 inches long. I used a 1/2 inch seam allowance. With right sides together sew your waistband together and iron seam open. (When I fold the waistband it will become 2 1/2 inches wide). Now back to the "skirt". First measure the zipper length onto the waistband and skirt. and then measured down 4 1/2 inches on the back of the skirt and marked it. Can you see where the pink and yellow pins are? That's where I started sewing. Snip where the seam begins, but don't cut your seam! Now measure the top front of your skirt. since my waist is 24 inches. or you can gather it. I'll show you how to do both. and sew along the top of the skirt. Gently, and I do mean gently, pull the top thread to gather your skirt. Gather the skirt until it meets your measurement requirements. and make sure the side seams line up. Use the largest stich on your sewing machine and sew closed the zipper opening. I use double-sided interfacing to make the zipper "stick". This is easier then pinning or basting the zipper. Using your zipper foot, sew on the zipper. Take the top part of your waistband and fold over. Tack down with needle and thread. Then tack down several places on the lower part of the waistband to hold in place. Using a seam ripper, rip out the large stiches you put in for the zipper. Doesn't the zipper look nice?! Finish by sewing along the very edge of the top part of the waistband. 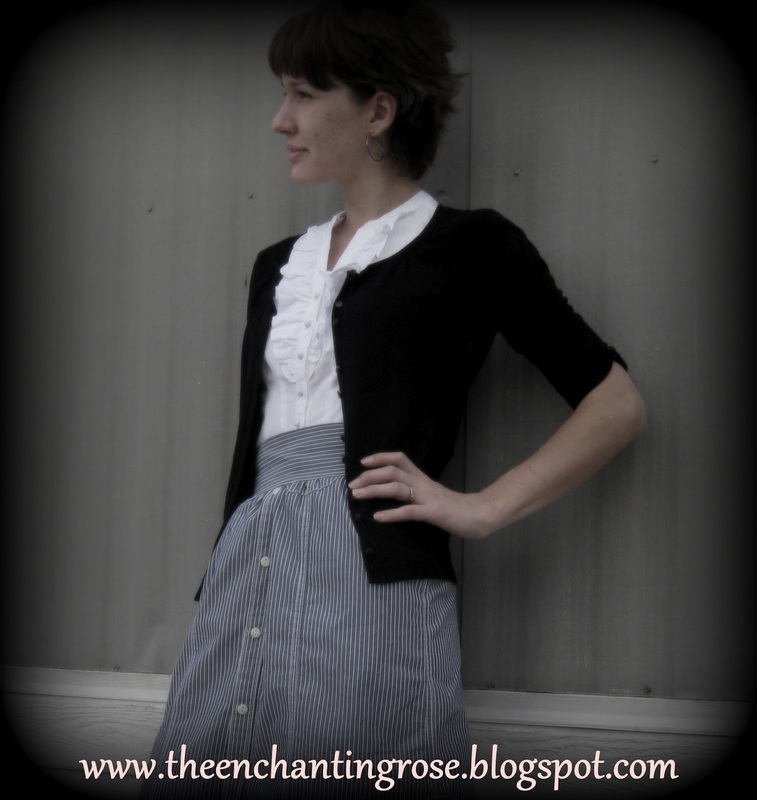 And if you don't want to gather the skirt and would rather make pleats than this is how you do it. and then folded the fabric in towards the center. and repeated the process until my skirt fit my waist measurement. I had 10 pleats on the front and 10 pleats on the back. and then sew on the waistband,etc. She has a delightful and encouraging blog filled with wonderful pictures. A BIG THANK YOU to all those that participated in the Fall Giveaway. After all, you could be the lucky winner next time. This quote from Elisabeth Elliot is short, but very powerful. "Let not our longings slay the appetite of our living." Summer's flower's are almost gone so I have been enjoying the last of them. Words can't describe how delicious this chocolate trifle is. My husband, who is not a chocolate fan, enjoys this dessert. Cut into 1 inch squares, or just use your hands and crumble into small pieces. stir into pudding mixture until no streaks remain. until you have whip cream. layer with brownies, pudding mixture, fruit, whip cream; repeat. Top with whip cream, fruit and chocolate chips. Refrigerate 6 - 8 hours before serving. A fun way to wear your scarves. and you'll look cute and be comfortable. 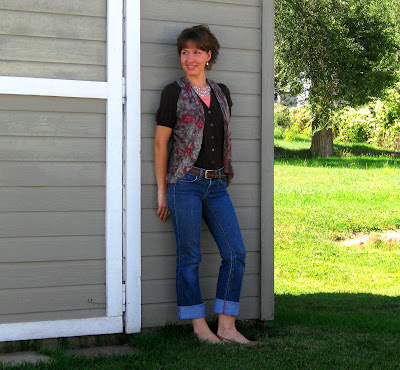 I can wear all the scarves and vests that I want. 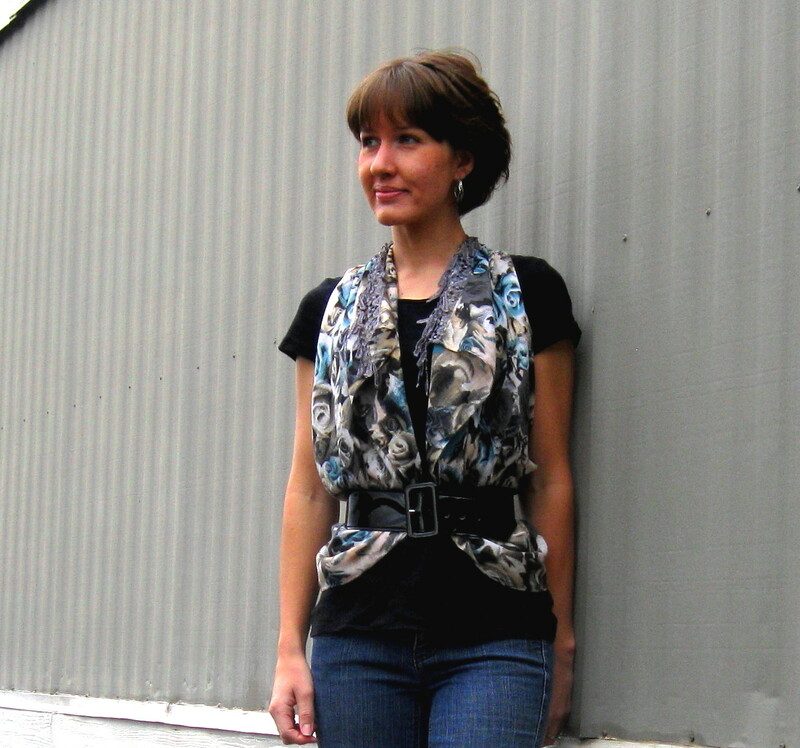 you can make your scarf into a vest. All you need is a scarf. Fold your scarf in half. Take the corners on each side and tie into a knot. Open your scarf up until it looks like a vest.